Design 1 for Rep Table runner. 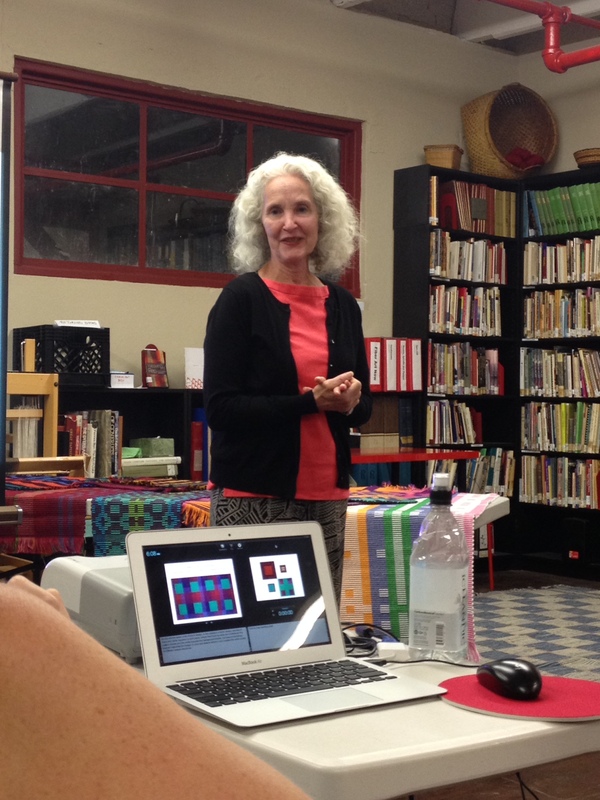 Hard to believe that over a week ago I was taking my second workshop from Rosalie Neilson. We have set up our looms to weave tables runners. There will be enough warp to weave 11 different motifs. I plan to do 2 table runners, not one long one. Tied on and ready to weave. My color scheme was inspired by pumpkins. Two motifs down and 9 to go! 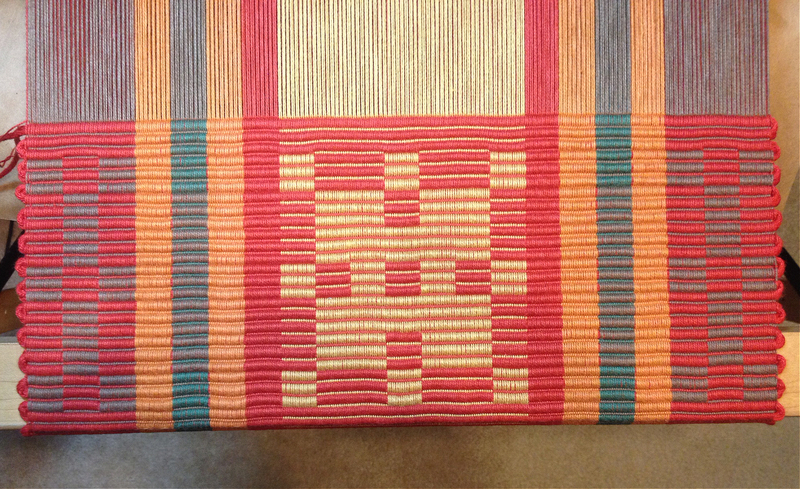 My warp from the Rosalie Neilson‘s Rep Weave workshop put on by the Contemporary Handweavers of Houston guild, has been woven and is off the loom. It’s been a few years since I’ve woven Rep. The workshop, “It’s in the Warp: Color& Design in Rep”, is worth taking. Rosalie explained in a precise manner how this weave structure works. The 4 yd warp let one explore the design possibilities of this weave structure. Except for the trials caused by the sticking harnesses on my 8 shaft Baby Mac loom this was a great workshop that I would highly recommend. Below are the pieces woven as I explored the possibilities of weaving rep.
You can see other workshop participants rep weaving by clicking on this link: http://weavehouston.org/reppin-with-rosalie/. The 15 weavers could choose from different pattern threadings so there is a variety of Rep patterns produced. .
Warping of the painted silk has begun. It’s ready to be sleyed and threaded. 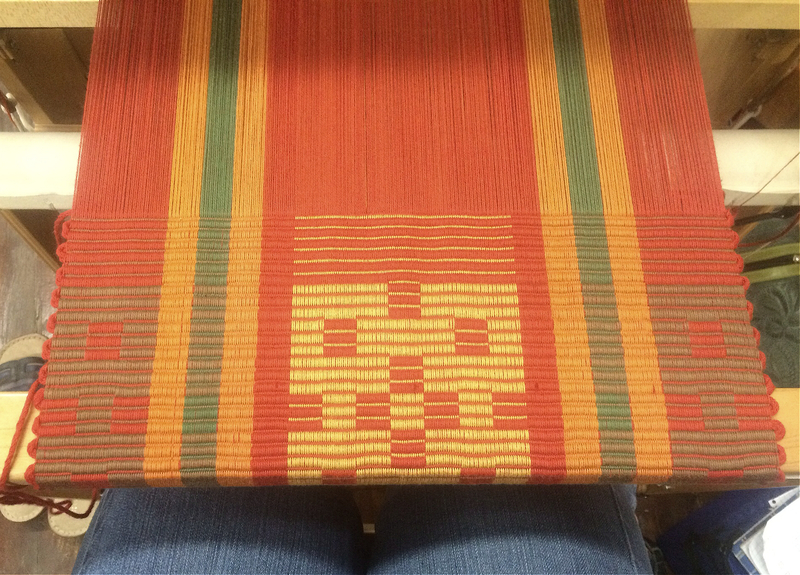 The warp was painted earlier at a dye day at the Contemporary Handweavers of Houston‘s Guild House. I wasn’t excited about the results, so I set it aside for a few months. Now I’m ready to put my design ideas to work. I will be threading an 8 harness manifold weave. I’m still debating weft colors so that will probably need some sampling. 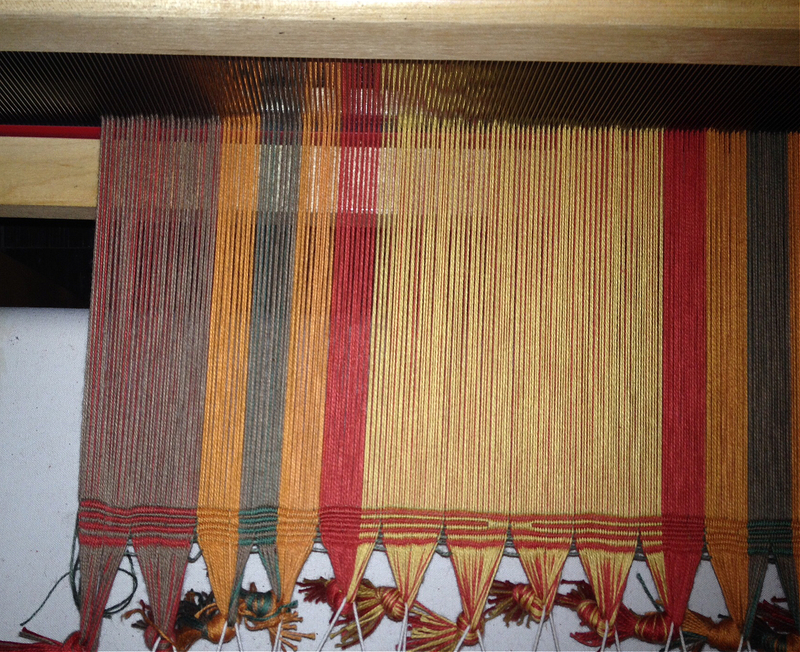 On the inkle loom a new tablet weaving is in the works using three colors in the warp and 16 tablets . There is still one loom naked so I hope this next week to work on another project for it. A Mangle is a tool that adds beauty to finished Linen items. Linen that has been mangled is imparted with a sheen that is hard to attain by other methods. In modern society it might be viewed as an item of torture. Non electrified, this mangle requires manual labor, it goes against our modern society. One of the members of the Contemporary Handweavers of Houston has loaned this mangle to the Guild membership to use. The mangle was acquired in Sweden needing some tender loving care, which Julie’s husband provided. Having never used a mangle. I was eager to see the difference that it would make to the appearance of a linen textile. Tracy demonstrated the use of the mangle for our WOW study group. She misted with water the piece to be mangled and ran it several times through the mangle rollers between an upper and lower layer of sheeting fabric. This look can not be attained by ironing alone. It is best done after washing the linen item for the first time and air drying ( no machine drying), till slightly damp. I definitely will attempt to mangle any future linen items I weave.